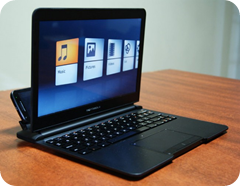 The specs of smartphones today rival those of netbooks and some low end notebooks. 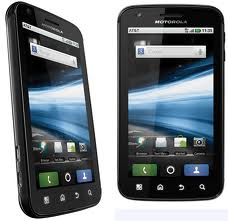 The Motorola Atrix 4G was touted as above average in the power department. Motorola is onto something, and I think this paradigm is the future in the post-PC era. 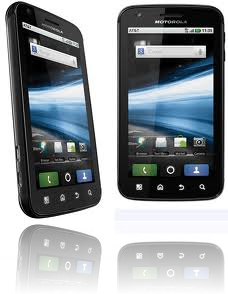 The Atrix 4G touts a dual core CPU running at 1Ghz and a GB of RAM. The reviews of this “phone” haven’t been stellar. This little Android based powerhouse has a 4 inch qHD display, delivering 950×540 resolution and 24bit color. Note that’s a 16.9 aspect ration. The screen is said to be a victim of glare when using it outside due to its glossy screen. Also, the average reception is about on par with the iPhone 4. So basically, you have a 11mm thick phone with a lot of horsepower, a pretty decent screen, average battery life, and a built in fingerprint reader. It does stand head and shoulders above the completion in one area, though. Accessories. Someone finally did it. Someone finally did something that seems so obvious I’m surprised it took this long to happen. They’ve turned their smartphone into a potential laptop replacement. Maybe this is a little before its time, but I think we’ll see this more and more. For the Atrix, its all about the accessories like the lapdock. It’s ultra thin, super light, and super cool if you ask me. This 2.4 pound clamshell device is like a zombie laptop. It just needs the Atrix brains to be plugged in. It has an 11.6 inch screen, full sized keyboard, and a trackball. Oh, and did I mention two USB ports? It also charges the Atrix when it’s plugged in. All for the currently hefty price of $299.99. Since it’s Android 2.2, you get your flash games and apps. A true web experience. Just fire up Firefox 3.6 with Flash support and go to town; or Farmville. 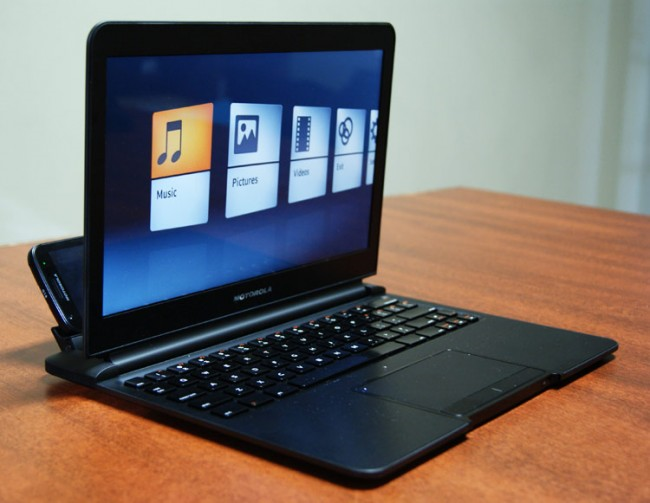 Now its not a true laptop in the traditional sense of the word, it is still powered by a phone. Yet, imagine if this phone ran Android 3.0, the version of Android built from the ground up to support larger screens? Then, combine that with Google Docs. Will someone end up making an aftermarket equivalent for the iPhone? Would Apple even allow such a thing? Maybe when iOS 4.3 reaches the iPhone? Where’s blackberry in this mix? Or Nokia? There are only two other manufacturers I would expect to see something like this from, HTC and Samsung. HTC’s products like the flyer and their upcoming phones like the thunderbolt (WOW, this phone looks cool) [Verizon] as well as popular Inspire phone [ATT] models make HTC the elephant in the room few people are talking about. Nielsen’s Jan. ‘11 chart shows manufacturer market share. Yes, Android may be the top smartphone platform, but Apple is in a fight with RIM for a fight as top manufacturer. Checkout the Red boxes, though. Those are all HTC. 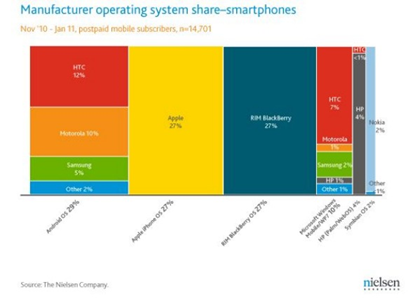 If Apple and RIM are both at 27%, note that HTC is at 19%+ (There’s a small clump of red in the WebOS column). Yes, it’s seven to eight percent lower than Apple and RIM, but it’s a solid 3rd place globally. Once those guys figure out to start standardizing phone geometry and IO ports, watch out. Leave a Reply to 2Ghz-4Ghz Smartphones & Unlocked boot loaders.